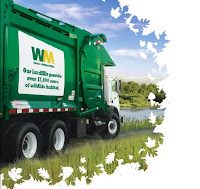 Waste Management is the largest trash hauler in the United States and ranks 196th on the Fortune 500, generating almost all of its revenues from transporting garbage from homes and businesses to landfills. They have 273 of them throughout the country with enough capacity to last for at least the next 40 years. Picking up and disposing of people's waste is not going to be the way this company survives long term. Our opportunities all arise from the sustainability movement. This is not David Steiner on some quest to save the planet. I don't get paid to do that. I get paid to generate shareholder value. Stock analysts, fixated as they are on generating near-term portfolio churn, don't get it. Most material still goes into landfills and probably will for some time; however, under Steiner's leadership Waste Management has decided, as their tag line puts it, to "think green" and is showing that sustainability is good business sense for the long term.